This week's color challenge was Basic Grey and Pink Pirouette. I started with a Pink Pirouette card. I layered a piece of Baisc Grey on top. 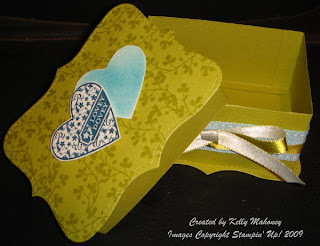 Next, I cut out a piece of Candy Lane DSPusing the Top Note die and my big shot. Then, I stamped the sentiment from the new Sale-a-Bration set in Basic Grey on the bottom of the Top Note. I wrapped a piece of striped Pink Pirouette ribbon around the Top Note and the Grey layer. Finally, I colored a piece of the So Tweet Chipboard with White Craft ink. Let it dry and then used the Tombow multi purpose adhesive to add the chunky glitter. I finished it off with a new flower brad and put it on the card with Dimensionals. I also did color the center of the flower with a black sharpie marker. I am a little behind in posting my color challenges. So here is last week's and tomorrow, I will post this week's. The Colors were Chocolate Chip, Old Olive, Always Artichoke, and Sahara Sand. I stamped part of the Baroque Background stamp in Artichoke ink on Sahara Sand. It is a little hard to see in the photo, but this is layered on Old Olive and then on a chocolate chip card. (The card measures 3x6"). Then, I used pieces of Artichoke DSP and made little pleats, or folds like you would use for Iris folding, on the right side. Finally I stamped the sentiment on the bottom also in Artichoke ink. The Spring Summer Catalog is Live!!! I just wanted to let you know that you can now order from the new catalog! I just placed my order and can't wait to play with my new products when they arrive! Click on this pic on the right and it will bring you to my website! While you are there, check out my new classes and hit Shop Now to see some new products! You can place your order online or call me and I can place it for you! SPECIAL: The first 5 people to place online orders by Sunday(1/25) at Midnight will receive a Free gift from me! Hey! the new colors for this week's color challenge are Always Artichoke, Chocolate Chip, Sahara Sand and Old Olive! Give it a try! This week's color challenge is Kiwi Kiss, Baja Breeze, and Not Quite Navy. I have been wanting to make one of these Top Note boxes for awhile and have been putting it off. Why? I don't know.... because I had to take things off of my Big Shot to get at it and I was being lazy. OK - so that is why. So this was the perfect time to just do it! Clean up and use y our stuff, Kel!! SO here is my final product. I took 2 pices of Kiwi Kiss CS and ran it through the Big Shot with my Top Note Die. 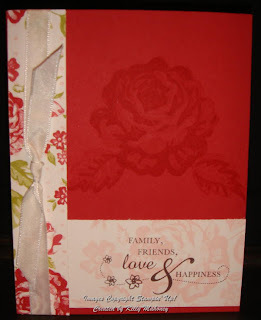 Next, I stamped one of them with the Floral vine stamp from the Fresh Cuts stamp set in Kiwi Kiss ink. On a piece of Shimmery White scrap, I stamped the Lovey Dovey heart from the new Hostess set called "A Little Somethin'" in Not Quite Navy ink. I carefully cut this heart out (since I do not have the new Full heart punch just yet). I used the negative image from cutting out the heart to stipple some Baja Breeze ink. I cut this out too! (I can't wait to get that punch!!) THese were put on top with some Dimensionals. Now for the box part. I took a piece of Kiwi Kiss CS (11"x 2 1/4") and scored it at 4" and 7" on the 11" side and at 1/4" on the 2 1/4" side. Then I took anothe piece (2 1/4" x 3 1/2") and scored it at 1/4" from each side on the 3 1/2" side(this made the flaps for the sticky strip) and 1/4" on the 2 1/4" side. The 1/4" sides are where I put the Sticky strip to adhere it to the bottom Top Note die. I have to say that if I make this again, I will make the side a little bit smaller. So instead of having a 4"x3" box, I would make it 3 3/4"x2 3/4". I think this will make it a little easier for the top and making sure you don't see the sides of the box peeking out from the top. For the box top, I took an 11"x 1 1/4" strip and scored it at 3 7/8", 6 3/4", and 10 5/8". The 3/8" left on the end of this strip is a flap for sticky strip. It is also scored at 1/4" on the 1 1/4" side. Then another strip (3 1/8" x 1 1/4") scored at 1/4" on the 3 1/8" side and on the 1 1/4" side. Again all of the 1/4" scores are for sticky strip. I know this probably a little confusing, if you take some card stock and see it, it should make sense... This part was adhered together and then to the top of the box. This fits inside the bottom part to secure the cover. Finally, I added the Baja Breeze Double stitched ribbon and the Kiwi Kiss/Very Vanilla satin ribbon. The Kiwi ribbon is amazing. This is first time I used it and it definitely will not be the last! I hope you enjoyed this take on the Top Note box. 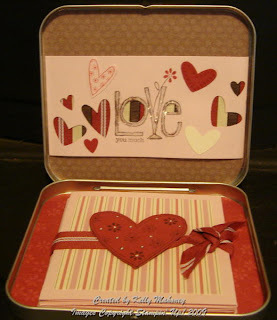 It would make a great hostess gift, Non-traditional Valentine, or just a little somethin' for someone special! Lately, I have been playing with my Love you Much Bundle which comes with the Love You Much Stamp Set, Candy Lane DSP and The new 3 heart punch(it has another name, but you know which one I mean). I remembered that I had bought some of the empty Accents and Elements tins awhile back. So, I decided to make a scrapbook. Let's start with the cover. 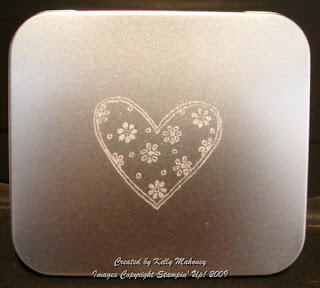 I kept this simple and just stamped and embossed the heart image on the top. Next, I made the inside top cover. Here, I punched out the hearts with the 3 heart punch and cut out the middle of the "o" and "e" with my Hobby Blade. I used a Technique Junkie ribbon technique to fill in these holes. Next, I covered the bottom of the tin with DSP. I cut and scored my card stock for the scrapbook and assembled it. Then, I got to the decorating of the pages. I kept it simple so that I could add pics and journaling later. The pages are decorated on both sides, I just could not add all of the photos here. 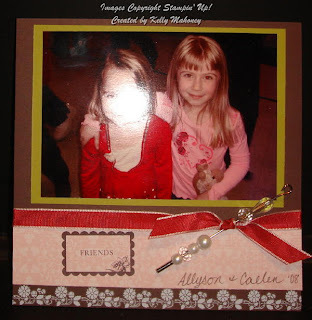 ... but if you would like to make this scrapbook, I will be having a class in early February. Stay tuned for more details. In the meantime, check out the rest of these pics. I told you a few weeks ago about the new Creative Challenge I was going to start posting for my group. 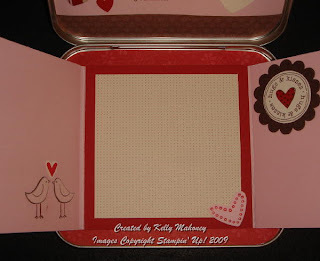 Well, the first one of the year is to use the Pretties kit on a project. My friend, Traci, posted a page she did last summer. Well, she inspired me to do a scrap page too. This is a 6x6 page. This pic is of my daughter and her friend from school. It was taken after their holiday show. (I got the glare in just the right place since I didn't have a chance to ask her if mom if I could post the pic.) The base is Chocolate Chip. The photo mat is Kiwi Kiss. The strip of Dsp is from the Bella Rose pack. 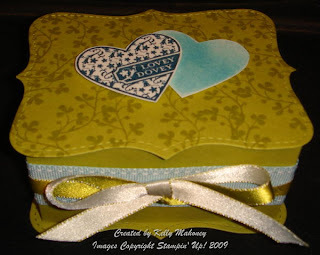 The rub ons for the sentiment and flower border are from the Chateau Bella pack. The ribbon is Riding Hood Red Taffeta. Finally, for the challenge, the hat pin and beads are from the Pretties kit. This page also works for the color challenge from this week. I hope you enjoy it. Leave me a comment with a link to your creation and I will post them here. So the first color challenge of the year is Chocolate Chip, Kiwi Kiss, Riding Hood Red, and Pink Pirouette. These are the colors in the Bella Rose Designer Series Paper(DSP). I have loved this paper since it came out. So was excited to use it in this challenge. Accessories: Bella Rose DSP, White Taffeta ribbon and Chateau Bella Rub-ons. I may try to make another card with these colors. I'll post if I do. Retired Accessories, Blowout Sale and More, Oh My! I know it has been ages since my last post. The holidays really just got me this year. I felt behind schedule the whole time. However, I did enjoy spending lots of time with my family. Anyway, Stampin' Up! posted some things today that I wanted to share with you. I also have a few projects and things to share with you over the next few days. I hope you will join me and check them out. First, here is the list of Retiring Accessories. Keep in mind that these things often go quickly, so if there is anything you want, please act quickly!! Now, Stampin' Up! is also putting a few of these things on sale, plus there are some previously retired items and even a few current items on sale! Check out this Huge Inventory Blowout sale! To see the retiring stamps, you can view the list in Alphabetical order - Here, or Numerical order - Here. Last but not least, there is a great promotion for Valentine's Day. This bundle includes a stamp set, a pack of Designer Series Paper and a new punch. All of these items will be in the New Spring - Summer catalog coming out on January 18th. Check it out here! Ok.... so I think that is it for now! Tomorrow, I will be posting the new color challenge for this week. So come back and see me soon!